Severe tooth decay can reach the nerves inside the tooth, which can lead to the inflammation of the pulp. The circulation of the tooth stops, and bacteria start to spread in the gum and the jawbone surrounding the teeth and cause an abscess. When can root canal treatment be used? 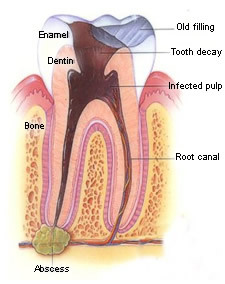 Root canal treatment can be used in case of severe tooth decay, in order to save a tooth with infected pulp. This can be caused by inflammation of the tooth or physical trauma. The pulp is the soft tissue at the center of the tooth that contains the nerves and is surrounded by dentine. Dentine is the hard tissue of the tooth. It surrounds the pulp and from the outside it is covered by enamel on the crown and cementum on the root. In case of severe tooth decay, root canal treatment can save the tooth from being extracted and allow the patient to use their natural teeth for longer. In the past, tooth with severe decay almost always had to be extracted, but these days they can be effectively be preserved by a root canal treatment. First, a small opening is made on the crown to remove the infected pulp. Since this is done under local anesthesia, the treatment is completely painless. After cleaning the root canal the dentist enlarges it with special files, so it can be easily filled. During the following visit, the medication and the temporary filling is removed, and the root canal filling is placed. Finally, the dentist seals the tooth with a filling or a crown, depending on the extent of the damage. How long will a root canal treated tooth last? Devitalized tooth can decay too, therefore practicing good oral hygiene is very important. Brushing your teeth regularly, with a good technique as well as using mouthwash and flossing can go a long way in preserving your oral health. Dental check-ups are recommended at least twice a year, to avoid problems going unnoticed.